(Newser) – A planned vote on Senate Republicans' overhaul of the tax code was called off Thursday night as they struggled to find 50 votes—and an extra $400 billion or so. Senators say deficit hawks led by Tennessee's Sen. Bob Corker have delayed the bill's progress by insisting it doesn't drive up the nation's deficit, Politico reports. 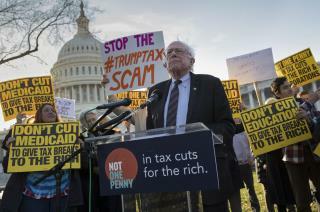 Earlier Thursday, the nonpartisan Joint Committee on Taxation released estimates saying that despite sweeping cuts, the tax overhaul wouldn't stimulate economic growth as much as earlier predicted, meaning it would add an estimated $1 trillion to the deficit over 10 years, reports the Washington Post. GOP leaders rewrote the $1.4 trillion tax bill behind closed doors in an effort to add $400 billion in revenue, changing it so that some tax cuts were rolled back after six years, the AP reports. "$1 trillion to the deficit over 10 years" Why not keep it simple and just say it will add 100 million dollars a year to the deficit. That's a number that's easier for Joe Sixpack to get his head around. Reading Fake News is like picking through garbage, you might find something good How many picked up on Rob Quinn's (likely) accidental journalism: 'Parts of it were rewritten Thursday night'? All through this and other debates on legislation in the making the comments here significantly miss that until it is passed into law there is all kinds of room for changes to bills. That's important for two reasons: We should not be making claims on what is not yet in place AND we should be demanding more from government and the Media in details, context and implication before we judge the job the Congress and others do.